1 Look I need help in deleting File:Leprechaun rifle 10.jpg. 2 How do I delete the image file itself but not in the article? Look I need help in deleting File:Leprechaun rifle 10.jpg. How do I delete the image file itself but not in the article? I tried to find many to ways to delete the picture but I can't and also I need this tip for future references. Been doing a little more digging (went to the National Archives) on whether or not the M6A3 used steel or copper as the liner. I scanned (its on my google drive) an original copy of OP 1720 to figure out what was going on with the M6A5. 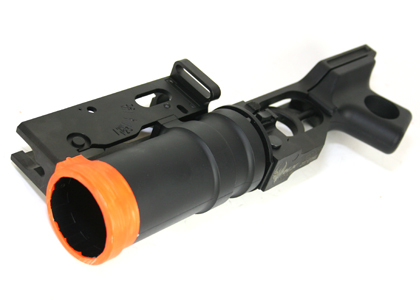 M6A5 has a copper liner and penetrates 4.5-5 inches at 30 degrees. Paper estimates 5.25-5.75 inches (call in 5.5 inches or 140mm) if vertical. Also, the same paper notes that the Cavity Charge Container Mk. 1 (page 12), uses the steel liner of the "2.36 inch HE, AT rocket". Also found this paper that explicitly list the bazooka as using a steel liner. Was my page the Type 94 75 mm mountain gun just not categorized properly? I wonder why it was deleted. Can you please delete http://www.imfdb.org/wiki/File:Mercenary_rifle_11_6.jpg from my account? Any idea what this thing is supposed to be? It's Lara's standard pistol from the new game, and all I could come up with is some M1911/Hi-Power/S&W semi-auto frankengun. True, but it's hardly the only one. I mean, to name a few, we've got the aforementioned L86, things like the Galil ARM and M27 IAR that aren't much more than normal assault rifles with a few LMG features, the Chauchat that'd lock up and refuse to fire if you used too much sustained fire (and often saw use as a sort of battle rifle in practice), and even things like the Federov Avtomat (which, in spite of intent, had far more in common with an assault/battle rifle than a proper machine gun) and the downright laughable M14E2 SAW (which fits this description pretty much perfectly - an implausible design brief that didn't pan out like it was supposed to, and essentially just resulted in a select-fire battle rifle with a bipod and a few other features that'd be more at home on a machine gun). I'll leave the final decision up to you, but were it up to me, I'd at least add the category and make a note on the page of how it was meant as a light machine gun, but turned out to be inadequate in that role, and was mostly just used as a battle rifle instead. Now, if you'd excuse me, I noticed a few other things missing from that category page that ought to be added. Sincerely, Pyr0m4n14c (talk) 22:17, 6 December 2018 (EST) P.S. : Maybe we should create a Discord. At any rate, it'd make discussions like these a bit easier. I uploaded and used the image of the Beta C-Mag instead of the greenish image of the G36 in MG36-identical configuration because there is often a fundamental difference between that image and these video games' railed MG36. Practically, the "MG36" in these games is a G36 with a G36C rail and bipod handguard (considering our the current definition of the MG36). By itself, without even taking the C-Mag into consideration, that is a very unusual configuration. I have not been able to find any images of real firing full-length G36s with G36C rails, let alone G36 with G36C rails and the bipod handguard. Thus, the airsoft image serves as the perfect illustrating image for the gun models in these games. This model is fundamentally different from a "MG36-mock-up-model" since it is not a normal G36 trying to look like a MG36. It is a "video game MG36", with G36C rails and bipod handguard and Beta C-Mag.